Exactly as described and pictured. Great quality fabric. 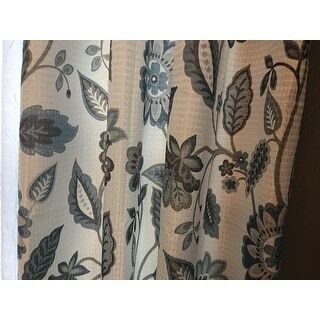 Beautifully frame your window with the stylish and functional SunSmart Laurel Printed Room Darkening Curtain. A floral design in deep and neutral hues is printed on a white dobby jacquard fabric creating texture and sheen for beautiful dimension and charm. Featuring a one pass foamback finish, this window panel provides a room darkening effect to soften harsh sunlight, while also serving as an effective barrier to dampen outside noise. Silver grommets at the top make it easy to hang, open, and close this curtain throughout the day; fitting up to a 1.25-inch diameter rod. Offering a moderate level of added privacy with nominal energy savings, this room darkening window panel brings a casual update to your home while creating a low ambiance lighting level, perfect for dining rooms, living rooms, or hallways. These curtain panels are really pretty, and definitely room darkening material. I like the design although it didn’t go with my walls so I returned them and ordered something else. These are actually privacy curtains! I've been looking for light curtains that are not completely see-through from the outside and these are it! They are not totally room darkening but I don't have to worry about neighbors seeing into my bedroom. They are a bit wrinkled to start but after hanging a few days the wrinkles came out. They are also a little shiny and could be mistaken for shower curtains because of the thickness but overall I am very pleased. The pattern is pretty. The background is a nice, creamy white and the flowers are a medium denim blue and grey. Very happy with my purchase. They came exactly as portrayed in the picture. They darken the room. They are good quality. They are easy to clean. I would recommend to a friend. These curtains are elegant and really block the sunlight. Don't iron them, since the backing is rubberized and will melt. I put them in the dryer for a few minutes and the wrinkles came right out. 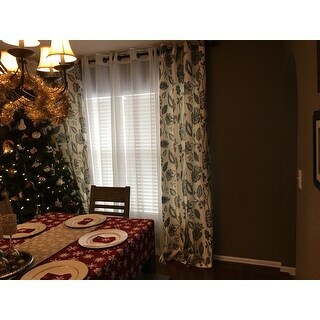 I really love these curtains and bought more for an adjacent room. 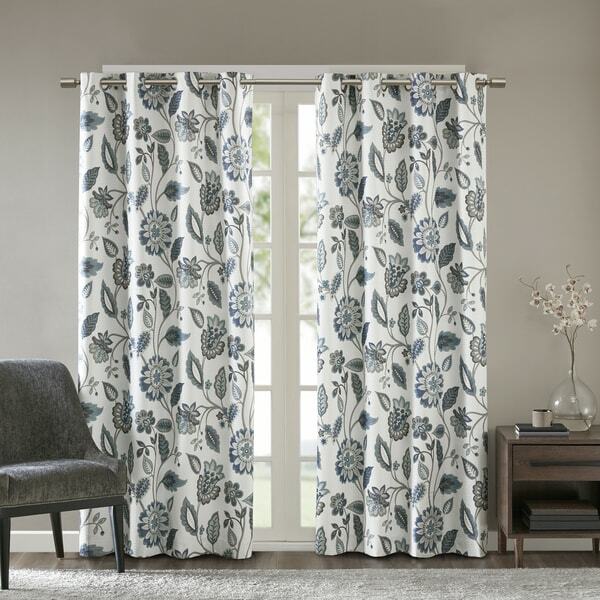 These curtains are nice and thick and have a really pretty floral pattern. The blue is more of a smokey blue versus a teal blue. For some reason, I was expecting the curtains to be a bit wider, but they worked well paired with a set of sheer curtains. Overall, I really like the set. I love these curtains and anyone thinking about ordering them go ahead you won't be disappointed. "Are the aqua a true aqua or more blue?"